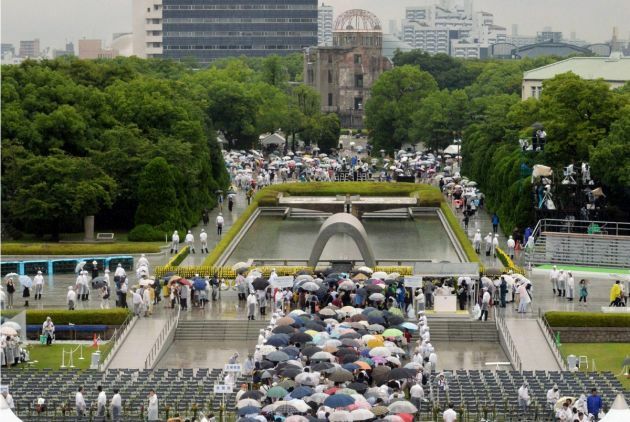 (Photo: REUTERS / Kyod)People wait in queue to offer prayers for the victims of the 1945 atomic bombing, in the rain at the Peace Memorial Park in Hiroshima, in this photo taken by Kyodo August 6, 2014, on the 69th anniversary of the world's first atomic bombing. Seventy years ago the surrender of Japan on September 2, 1945, brought to an end World War II, the greatest conflict that humanity had ever experienced. The surrender was preceded by the dropping of atomic bombs by the United States first on Hiroshima on August 6 and three days later on nearby Nagasaki in southwest Japan. More than 3 million Japanese and military personnel died in the war. These are tragedies that are to be remembered and must never happen again, Isabel Apawo Phiri, associate and acting general secretary of the World Council of Churches said on August 5. "Our thoughts and prayers go out to the hundreds of thousands of people who suffered these terrible attacks and to the aging survivors among them who still cry 'Never again' today," Phiri said in a statement. "We also pray for those whose lives and lands have been shattered as a result of the many nuclear tests which followed World War Two - in the Pacific, Central Asia, the western United States and elsewhere," she said in the statement. In their July 2014 meeting the 150 delegates of the highest governing body of the WCC, its central committee, declared that "nuclear weapons cannot be reconciled with real peace" and must be eliminated. They went on to say that using the energy in the atom to create something that threatens life is a "misuse of God's creation." The WCC is calling on its member churches to pray for leaders around the world who rely on nuclear weapons for their security to remember and learn the lessons of Hiroshima and Nagasaki, and to rid themselves of their nuclear arsenals. The majority of nations around the world reject weapons of mass destruction, and the WCC, its member churches and partners look to that majority for "conclusive action to eliminate nuclear weapons because of what these weapons do to humanity and the environment," the statement said.